If you are near shallow water (about waist deep) where the fish are large and plentiful, you can spear them. To make a spear, cut a long, straight sapling (Figure 8-22). Sharpen the end to a point or attach a knife, jagged piece of bone, or sharpened metal. You can also make a spear by splitting the shaft a few inches down from the end and inserting a piece of wood to act as a spreader. You then sharpen the two separated halves to points. To spear fish, find an area where fish either gather or where there is a fish run. Place the spear point into the water and slowly move it toward the fish. Then, with a sudden push, impale the fish on the stream bottom. Do not try to lift the fish with the spear, as it with probably slip off and you will lose it; hold the spear with one hand and grab and hold the fish with the other. Do not throw the spear, especially if the point is a knife. 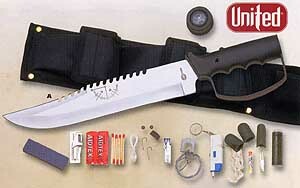 You cannot afford to lose a knife in a survival situation. Be alert to the problems caused by light refracti on when looking at objects in the water.